The Spread Matrix is very customizable. 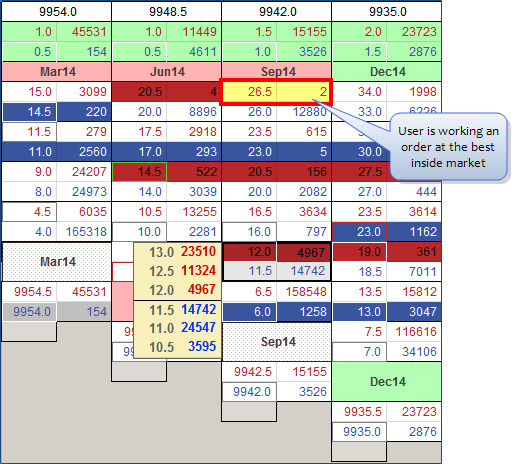 You can customize how the Spread Matrix looks and acts from the global properties Spread Matrix tab and Trading tab. Tooltips enables and disables mouse tooltips when you hover over a cell in the Spread Matrix. Cancel order buttons displays the cancel buttons at the top of the Spread Matrix. Uncheck this setting to remove the buttons from the window. LTP/Net Change row determines whether these rows are displayed at the top of the matrix. Select this option to hide these rows. Qty when hovering over price displays the quantity when you mouse hover over a price in the matrix. 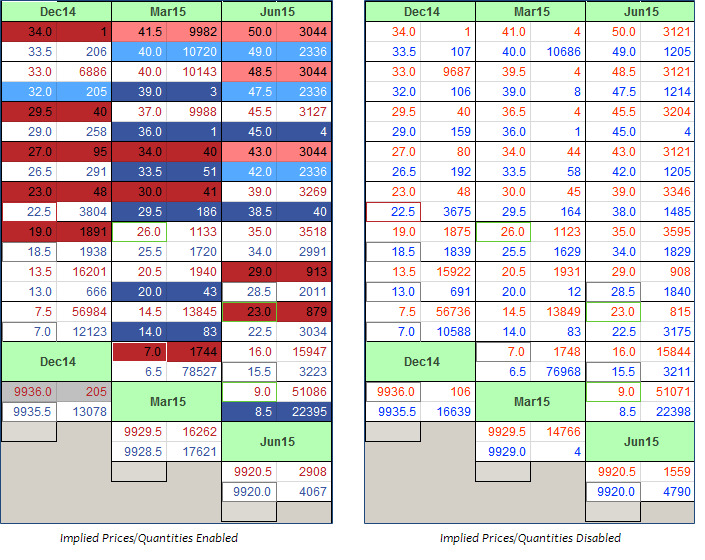 LTP/LTQ displays last traded price and quantity with the market data for each outright and exchange-defined calendar spread in the matrix. Implied prices/quantities color-codes the cell background to indicate whether the price and quantity is comprised of direct bids and offers, implied quantities, or a combination of direct prices and implied price. This setting is enabled by default.When this setting is disabled, the price and quantity display using only the combination (or white background) setting. Net Change color scheme with actual prices determines whether the Spread Matrix uses the price or Net Change color scheme. When this setting is enabled, the Spread Matrix displays prices using the Net Change color scheme (i.e., green when positive on the day and red, when negative on the day). See Spread Matrix for additional information. You can enable highlight settings from the global properties Trading tab. 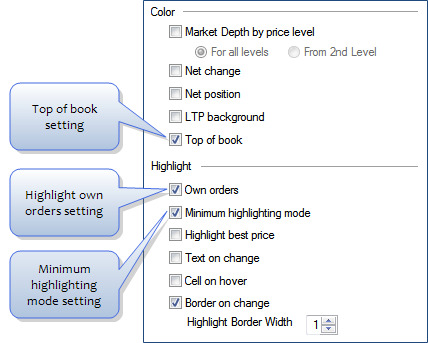 Spread Matrix provides two highlight settings which will you to quickly identify your orders working in the market. The Highlight Own Orders settings uses a lighter background to indicate that you have working orders in a contract. This settings works in conjunction with the Color settings. The Top of Book setting displays your order with a yellow background when it becomes the best bid or offer. Butterfly/Condor Matrix only highlights when both the quantity and price change. Highlighting depends on whether the last traded price is on the bid or ask. If the last traded price was not on the bid or ask, the matrix does not highlight. 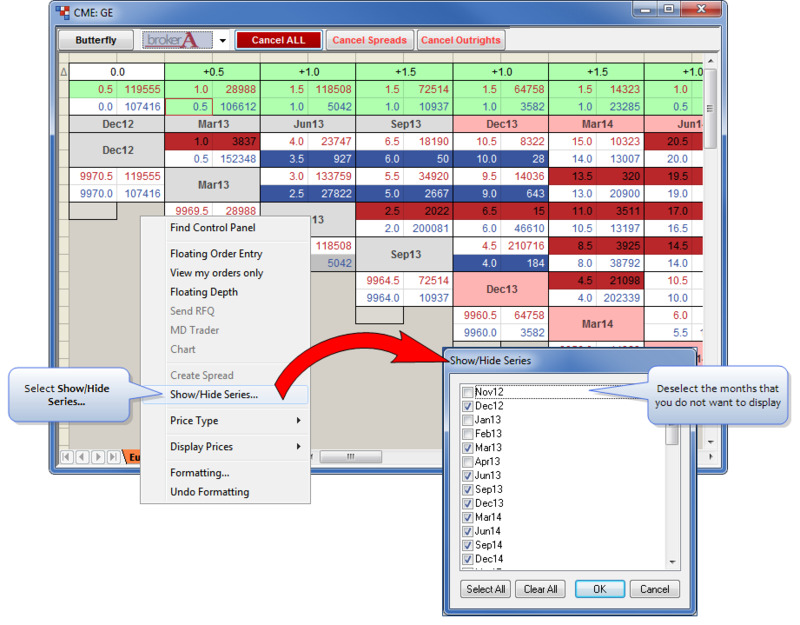 Individual Spread Matrix windows can be configured via the Spread Matrix right-click context menu. 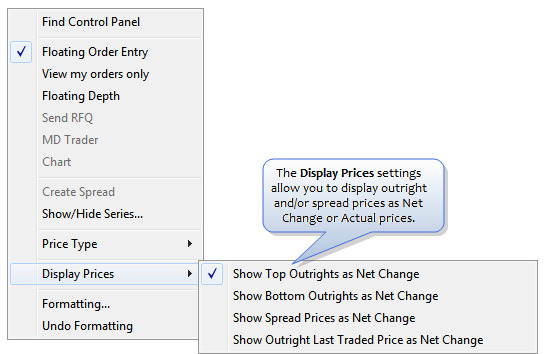 For example, you may configure which price the Spread Matrix displays for outrights and spreads via the right-click context menu. Right-click the gray area of the Spread Matrix to display the context menu. The right-click context menu provides various Display Prices settings. 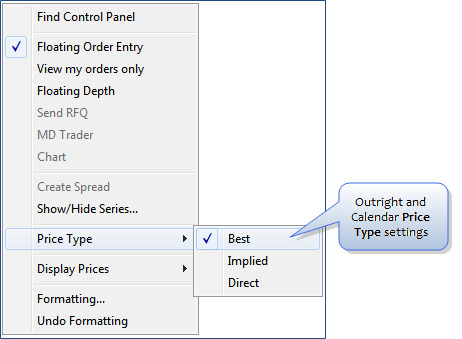 From the context menu, you can easily configure the Spread Matrix to display specific contract months using the Show/Hide Series option. The Show/Hide Series dialog box displays a list of the instrument's available contract months. Deselect the months that you do not want to display, such as the serial months. Then click the OK button to close the dialog box.